The feature debut of writer/director Jeff Nichols, Midnight Special tells the tale of protective father Roy (Michael Shannon) and his closest friend Lucas (Joel Edgerton) on the run from the FBI with Roy's only son, Alton (Jaeden Lieberher), who possesses unusual supernatural powers that must be hidden from those who attempt to misuse them. In the ensuing chase, more dark truths come to fruition, forcing Roy, Lucas, and Alton's mother Sarah (Kirsten Dunst) to eventually accept a difficult yet inescapable truth. 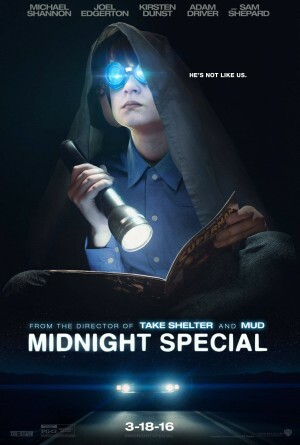 Midnight Special is an unusual film in that it has a lot of potential within it's concept, but this is sadly not met thanks to it's obsession with vague storytelling that makes it seem like Nichols assumed that the audience would have as good a grasp of his story as he did, thus negating the need for him to truly explain certain key events in detail. Whilst pandering to the audience when it comes to elaborating on simple narrative trademarks is of course never a good thing, not explaining complicated narrative threads and just letting them come and go as if they bare little to no real importance is the sign of both a poorly written screenplay and a poorly directed finished product. The weakly constructed story is partially redeemed by a lineup of strong performances, namely from Michael Shannon and Joel Edgerton, and especially from young newcomer Jaeden Lieberher. Their characterizations are equally as entertaining, perhaps the most compelling part of the otherwise delirious storyline, though it would've been nice if a little bit more depth was explored in terms of their motivations and backstories - the occasional lack of such exploration makes certain actions they do a little random and certain character interactions a little weak. Midnight Special thankfully isn't light on thrills, with a number of chase scenes and set pieces keeping us on our toes as we join the main characters in their attempts to escape from those who seek to misuse what is closest to them. However, as previously stated, the plot is too flimsy and underdeveloped that it's hard to fully justify why all these chases take place, leaving them quite tiresome as we enter the middle of the story; and while the excitement regenerates a little as the climax begins, the story sadly doesn't expand much further. The ending reaches a high point of ridiculousness, considering it's abrupt and visually bizarre nature, and by the time the credits rolled I was left confused and slightly saddened at a deeply wasted premise.